Flip would not be happy with the state of the franchise he rebuilt before unexpectedly passing away at age 60 on October 29, 2015. The Wolves are a mess and an embarrassment three years after Flip had started a process to try and position them for annual playoff runs and perhaps one day an NBA championship. He had been hired by franchise owner Glen Taylor to resurrect the franchise in 2013 and by the fall of 2015 the roster was young but promising led by high potential talents Karl-Anthony Towns, Andrew Wiggins and Zach LaVine, plus promising youthful role players like Tyus Jones. Now the Wolves have an older, less promising and seemingly disgruntled roster, mostly because of Tom Thibodeau, who wields similar power to what Flip had. Thibodeau traded for temperamental Jimmy Butler in 2017—sending away LaVine, Kris Dunn (2016 first rounder, fifth pick) and a 2017 first round draft choice to the Bulls. After one season in Minnesota, Butler wants out and is willing to do and say extreme things to agitate Thibodeau and Taylor enough to trade him away. The Bulls thought enough of LaVine, 23, to sign the shooting guard to a four-year, $78 million new deal during the last offseason. Dunn, 24, improved in his second season in the NBA, averaging 13.4 points and 6 assists as the Bulls’ point guard. Chicago used the first round draft choice to acquire Lauri Markkanen, a forward who was one of the NBA’s best rookies last season. Bulls fans could be chuckling over the trade with the Wolves because their team added young potential in Dunn, LaVine and Markkanen. The deal allowed the Bulls to move on from Butler who reportedly was high maintenance in Chicago, too. Thibobeau gambled on a high quality two-way talent in the 29-year-old Butler who reportedly wants out of a Timberwolves uniform because the organization hasn’t shown him enough appreciation. Butler didn’t participate in any preseason games as he dramatized his desire to be traded, but tonight he is expected to play in the regular season opener before the Wolves come home to meet the Cavs on Friday at Target Center. He is part of a roster that Thibodeau has reshuffled to make more experienced, not only with Butler but also Luol Deng, Taj Gibson, and Anthony Tolliver, who are all 33 years old, and Derrick Rose and Jeff Teague, who are both 30. Those are all starters or key contributors off the bench. Flip had a vision of stockpiling young talent and taking a patient approach. It appears Thibodeau has been intent for awhile on a commitment to win as soon as possible. If Flip had a five year plan, Thibodeau’s win now approach seems more like five months. The problem is things are going in reverse with Butler being critical of Wolves teammates and wanting out. He reportedly expressed his desire over the summer to move on, and if true Thibodeau should have traded him awhile ago rather than put the franchise through the current drama. We will know before long what kind of future Butler has with the Wolves—if any—and the type of season the team will experience in 2018-19, hopefully adding value to the roster by trading him. Butler is a top 15 NBA player and he was the difference maker last season in the Wolves making the playoffs for the first time since 2004 but it’s nearly impossible to believe he will be on the roster when the league’s trading deadline comes up on February 7. During this preseason, without Butler and with all the negativity surrounding the club, the Wolves didn’t look anything like a playoff team. At times they appeared downright disinterested and awful like in their final preseason game last Friday night in Milwaukee when they gave up 84 first half points to the Bucks. Flip would have been upset watching that. He had invested so much of his basketball life into Minnesota’s professional team. His first round of duty with the Wolves started in the mid-1990s when he was hired in the front office but soon he became head coach. He marched the sidelines during the franchise’s best years and was unfairly dismissed as coach during the 2004-05 season. 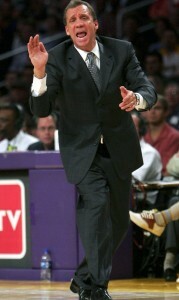 When Flip came back to the Wolves about eight years later he was in a power position as president of basketball operations. I think if Flip had lived he would have eventually put together a group of investors, perhaps including Kevin Garnett, to buy the team from Taylor. Flip was a part-owner of the franchise at the time of his death. That move would have been the ultimate step in Flip’s basketball life. The former University of Minnesota point guard was a basketball grinder as a player, executive and coach. He worked his way up through the lower levels of the game and even when living away from Minnesota kept a home here. Flip loved the people and basketball in this state, including the Gophers and Timberwolves. He was always ready to do whatever was needed, whether it was Xs and Os, college scouting, NBA trades, pitching potential owners, or marketing his team to the fans and media with public appearances and news gatherings. Flip had a long term plan to finally make the Timberwolves great but there is doubt whether those who have followed him, primarily Thibodeau, are up to carrying on his legacy.